Acud Macht Neu presents: the seventh edition of the creative development program Amplify Berlin features live sets from mentees AIJU and M accompanied by their mentor Ville Haimala on the decks. ... is a Finnish-born Berlin based artist and producer best known as one half of music duo, performing arts troupe, experience design studio and production house Amnesia Scanner. Amnesia Scanner has released a series of critically acclaimed albums/records on labels like Young Turks and PAN and presented work at art institutions such as ICA London, HKW Berlin, and the Serpentine Gallery Marathon in London. 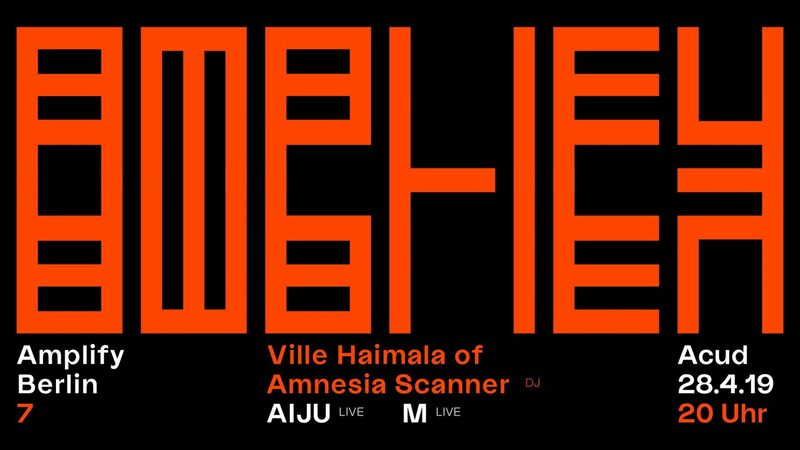 Aside working on Amnesia Scanner, Ville is also working as a composer and music producer collaborating with visual and musical artists like FKA Twigs, David Byrne, Holly Herndon and Oliver Laric. ... is an emerging producer whose listening has been shaped between London and Moscow, who works with the impossibility of the club and femme4femme feelings. ... is an intermedia artist and a researcher who is interested in the parallels and intersections between music, computing, and brain function. Their current audiovisual work explores projected-selfs and in-between states. Recently, M has been developing mixed-reality musical instruments and completing a master’s in "Sound in New Media/Human Neuroscience & Technology". Amplify Berlin is a creative development program at ACUD Kunsthaus. Each month, Berlin-based emerging musicians have the chance to be mentored in composition, production and live performance by established musicians. During each one-month residency, two emerging artists receive feedback and advice from their mentor, work in a private music studio, develop their live set in the ACUD Clubs concert space, as well as present an online radio show. Each residency will culminate in a live set performed by the mentees at a showcase event on a lineup alongside their mentor. Amplify Berlin is co-financed by the Europäischer Fonds für regionale Entwicklung (EFRE) and Musicboard Berlin.